These cane bolts were made here in Tucson by the same blacksmith who makes my speakeasy grills and wrought iron hardware. The hammered back plate is 1/4" thick and the bolts are 5/8" in diameter! Massive and heavy duty, they are the only bolts I use on my rustic gates. The bolts can also be used on entry and interior doors for the ultimate in style and security. I have one (1) set available for immediate delivery. A set includes a top and bottom cane bolt and a bracket for the top bolt. The bottom bolt back plate is 22.5" x 2", the top back plate is 16.25" x 2". 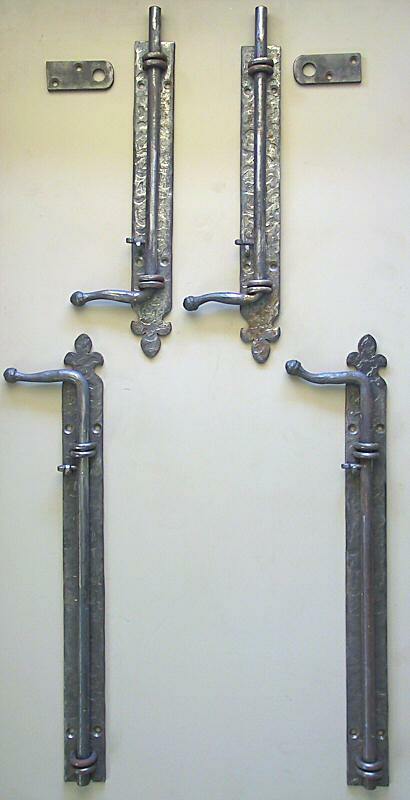 Both sets are designed to be used on a right hand door (hinges on the right standing outside). Price: $498 per set (1 top bolt, 1 bottom bolt, 1 top bracket) and includes free shipping in the continental US.